This post is a heads-up notification that NEXT month in this time slot, the second Monday of the month, and moving forward into the months beyond, right here on this blog, there will be a blog series by Julie Gribble, writer, and director of New York Media Works, LLC. No, that picture to the left isn’t Julie! 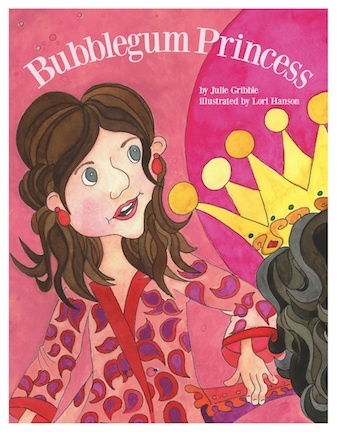 That’s the cover of Julie’s book, Bubblegum Princess, which will be the topic of her blog series. The series will explore the process she went through to independently publish this book, and she’ll also explore some of the pros and cons of this type of publication, as well as learnings she’s gleaned from the experience. Julie started out in the world of film, and is still a screenwriter and independent filmmaker through her company New York Media Works, LLC. She is also an up-and-coming writer for kids, having launched her first picture book, Bubblegum Princess, published through New York Media Works, the day His Royal Highness Prince George of Cambridge was born. You can read more about Bubblegum Princess by clicking “open” when you get to the New York Media Works website. For the past year, Julie has been one of the inaugural group of Children’s Literature Fellows at Stony Brook Southampton University on Long Island. This initiative, headed up by Emma Walton Hamilton, allows people who, for one reason or another are not able to enroll in a full MFA program in Children’s Writing, to do a one year certificate program in Children’s Literature, working mainly from home, and being mentored by a well-established children’s writer. To read a review of Bubblegum Princess, go to the website of the King of Kid’s Book Reviews, Erik at This Kid Reviews Books. Here’s the link to his review. Now, get yourself some bubblegum to while away the time until the second Monday of February, and come back here then for the first post in Julie’s blog series! I look forward to the series Beth and Julie. It sounds very interesting. Have yet to read her book, so must do so before you start! Thanks, Pat. I’m looking forward to it, too! I’m sure I’ll be learning a lot with Julie’s upcoming posts!